With the Soni-Grow sound and nutrient system, fruits and vegetables will grow bigger, mature earlier and last longer. You'll produce healthier plants, decreasing the need for harsh, chemical rescue, because a healthy plant will be more resistant to insects and diseases. The sound increases absorption of the nutrient spray through a foliar feeding system that enhances any type of plant or crop, with dramatic increases in growth, yield, as well as early maturity. Soni-Grow nutrient is an organic blend of nutrients, enzymes, hormones, carbohydrates and stimulants. 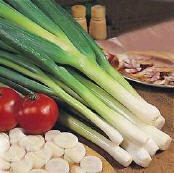 Among the most important nutrients are nitrogen from organic sources, potash, phosphorous and calcium. The CD included in the Home and Garden Kit can be played by any home CD player or for more commercial use get a Veges® Sound Machine. Either way the special, audible, low frequency sound (less than 4000 Hertz), will cause the pores in the leaves to open and so increase absorption of carbon dioxide and Soni-Grow's Nutrient many times over. The sound increases plant absorption both foliarly and by root uptake, resulting in greater growth and production. Soni-Grow Nutrients have been frequency tuned to match the sound produced by the CD or Veges® Sound Machine in order to produce the greatest possible results. There are other plant growth stimulants, but the Soni-Grow's performance is a result of its unique use of low frequency sound and frequency tuned nutrients. Get a Soni-Grow home and garden kit for your back-yard garden, which includes a 16 ounce bottle of the nutrient solution. 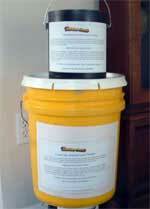 Later you can buy the nutrient solution by the gallon or in drum quantities for commercial use. Soni-Grow's patented sound and nutrient technology, specially balanced for foliar feeding will enhance the growth of crops, producing measurably increased yields of high-quality, nutritious, healthy fruit, vegetables, nuts and herbs, as well as outstanding flowers and tree growth. Soni-Grow's effect on plants can be tested right away using a Refractometer to measure the Brix (sugar content of plant sap), before spraying, and again about ½ hour after spraying -- or use a control group that does not get treated with Soni-Grow as a basis for comparison. You'll be amazed at the results, and the results are even more amazing when applied to the seeds! 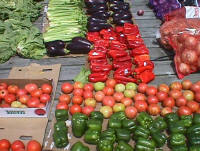 Row crops such as lettuce, spinach, soy beans, broccoli, corn, onions, potatoes, carrots, tomatoes, etc. 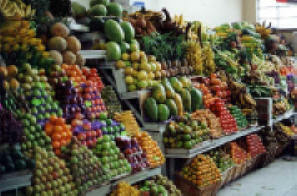 Bush crops and berries such as strawberries, raspberries, blueberries and bush beans, etc. Inexpensive to use, producing much more in yield than the cost of the product. Soni-Grow Nutrients are an organically based, specially balanced blend of nutrients, enzymes, naturally occurring hormones, carbohydrates and stimulants. It's the best possible "balanced food" for your crops. Among the ingredients in the blend are: organic nitrogen from compost tea extract, kelp, natural plant sugar extracts, natural growth regulators and stimulators and amino acids. Because the nutrients contain ingredients such as kelp, just about all trace minerals that are found in the sea will be found in Soni-Grow. However, because they are only in "trace" quantities, they cannot be placed on the label. Plants benefit dramatically from only a small quantity of trace minerals. Our nutrient solution provides plants with the correct balance of these trace minerals. The finished product is frequency tuned to the sound produced by the Veges® Sound Machine and tape, making them completely compatible and harmonic. No other foliar spray will perform as well with the Veges Sound Machine. Frequency tuning increases the potency of the effect of the nutrients when sprayed in conjunction with playing the unique low frequency sound. The sound played before, during and after spraying, increases the receptivity and absorption rate of the plant, and prepares it to receive Soni-Grow's high potency nutrition. The Veges® Sound Machine covers a 50-100 acre circular pattern with low frequency sound tones that stimulate the plant foliar uptake by opening pores. It will increase the absorption of carbon dioxide, moisture and nutrients from the air. The low frequency of less than 4000 Hertz is not blocked by buildings or trees. These sealed units are built to last a lifetime when properly cared for, as there are no moving parts. It comes with a built in solar panel/battery charger and timer. You'll also need to locally pickup (3) 5 ft. by 4 inch, schedule 40, PVC pipes, which become the "organ pipes" to amplify the sound. You'll also need a regular car battery to power the sound unit, while it's power is restored by the solar panels meaning it will power itself from the sun. A separate stand should be used with the Sound Machine. The stand should support the sound box such that the bottom of the pipes are at least 12 inches off the ground. It can be more than 12 inches, but never less. The sound that the unit emits will travel down the PVC pipes and will then roll out along the ground. This is the best way for the sound to travel. You can build your own support unit as long as it keeps the bottom ends of the PVC Sound Tubes that you attach to the sound box, at least 12 inches off the ground or purchase the specially designed aluminum stands. Be sure to attach the sound box to the frame to prevent dislodging or theft. You will also need to put spacers between the 5 ft. tubes in the middle and/or near the ends to prevent dislodging the collars from the bottom of the sound box. Set screws may also be used to secure the pipes into the collars. Gluing is not recommended as it makes the entire unit cumbersome to deal with thereafter. Finally, we suggest some flexible screening be placed over the bottom end of the pipes to prevent insect or bird entrance. The unit should never be played if it is not attached to the 5 ft. PVC pipes. However, you may want to test the unit before you go to the trouble of mounting it in the field. The unit should produce an audible sound. However, Do not play the sound for more than 5 seconds without the pipes or damage will occur. If a unit does not produce an audible sound when attached to a 12 volt car battery and selected for "manual" mode when first received, then it should be returned post paid for an exchange. Be sure and note the small indicator bar that appears in the face of the timer as you select the various modes. Important to remember: The sound produced by the Sound Machine, although a low frequency, is audible. If when standing next to a plant you cannot hear the unit from a given distance with normal hearing & no distracting noise, that means it is probably not working on that plant. There may be some residual benefit to the plant, but it will not produce the desired results. The Veges® Sound Machine is intended for commercial acreage of 50-100 acres. It can certainly be used on smaller acreage, but might not be as cost effective for small areas as the use of a tape recorder or boom box. For Greenhouses, the sound from a tape is sufficient. If you have acreage that you feel is too small for the Veges® Machine, but too big for convenient use of a tape recorder or boom box, here is a suggestion: Connect a tape player or boom box to the front of a tractor, and one to the back. As the tractor travels through the fields, the sound will be emanating in both directions. Then park the tractor in the area and let it continue to play for another 20-30 minutes. Normally, you want to play the sound at least 30 minutes before you spray and at least 30 minutes after you spray, but this technique is worth trying. Continue filling the tank to desired volume. Circulate tank to mix. One of the theories behind this frost protection is that the increased sugar levels and the rapid stimulated translocation of the Nutrient by the Sound Unit "exercises" the vine and induces production of plant sugars and alcohol. Alcohol does not freeze. Also, a healthy plant will trans locate water out of the cell interiors into the intercellular spaces. Ice crystals in the intercellular spaces will not damage cell structure. A. Yes, you can. It is important to follow directions, because you can over stimulate a plant and do harm. Soni-Grow is a very "high energy" product. Plants grow from energy, not fertilizers although fertilizers supply energy and may be incorporated into the plant structure. The Spray Programs are designed to provide the right amount of energy, stimulation and nutrients for the plants and provide excellent results. You can "over spray". On the other hand, playing the sound unit throughout the season at designated times is a recommended practice. Just try not to stray dramatically from the prescribed programs. Note: Soni-Grow Nutrients should not be left in direct sunlight, or allowed to freeze. 85 Day Delectable Sweet Corn – Tasseled in 49 days and eaten at 65 days. Reported by Dave Weber of Iowa, owner of 3 units. 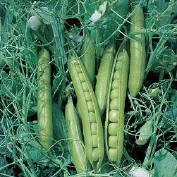 Soybeans were 25 to 30 percent larger. Harvested 18 brix alfalfa. Haven’t had to spray alfalfa for insects for several years, even though neighbors spray repeatedly right across the fence line or road. Reported by Kurt Uhlenhake of Iowa. I used the Soni-Grow last year on tomatoes that I grow in a greenhouse. I had great production from July to October in 2006. We had a heavy early freeze, in October, but my plants were still blooming and setting every crown, clear up to that freeze. I had the best tasting tomato and the heaviest setting that I had ever experienced. Usually after 2 or 3 months of picking, the vines get "tired", but that crop was still going strong from planting in May all through October. Needless to say, I am applying it again this 2007 growing season, and I will try to keep a sound record, so I can really tell what my production was. I live in Washington state, 7 miles from the Canada border so I get lots of rain and cold, summer is nice, but short. So I need all the help I can get, I do not use stoves in my greenhouse, and I plant right in the ground just like I would an outside crop. For two summers I have used the Soni-Grow and have had great results. This past summer I planted three tomato plants around the later part of April after the final freeze. My first tomato was nearly the size of a grapefruit. Since I had more tomatoes than we could eat, I gave extra tomatoes away on a regular basis. When the last hard freeze came in later October, I picked 73 green tomatoes. I kept enough to last me through November and the rest I gave to the church kitchen crew who like fried green tomatoes.